One night many moons ago (well about 5 years at this stage) I was web surfing and came across a company called Master Replicas. Some random clicking had taken me to the home of something I'd been looking for my entire life - a lightsaber replica that looked and sounded like the real thing. I've been a Star Wars fan since the first moment the Star Destroyer exploded onto the screen at the start of Episode IV - A New Hope way back in 1977. From the first time I saw Old Ben Kenobi ignite his lightsaber I wanted one and here it was in front of me just waiting to be bought. My credit card almost ignited I reached for it so quickly. Years and several lightsabers later I'm still a fan. Master Replicas don't make the Force FX range now (not sure why but they don't) and Hasbro has taken over production. 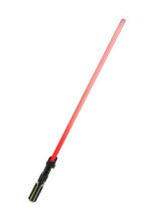 So the good news is that Force FX lightsabers are still available today and they're improving them all the time so they just get better with age (like most of the Star Wars movies). So what can a Force FX lightsaber actually do? Here's a quick breakdown of what you can expect. Believe me words don't do these lightsabers any justice. You really have to see one in action yourself and then get one of your family to help you pick your jaw back up off the floor - yes they're that good. Really. 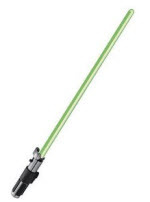 There are 8 different Force FX lightsabers available and you'll find something to suit everyone. You can now also get the Force FX lightsabers with removable blades! 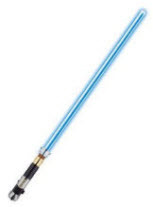 PS There have been other models available in the past like the Luke Skywalker version and the Mace Windu version. I'm not sure why these were taken off the market - especially the very distinct looking Mace Windu model?! The Force FX Lightsber vertical wall mount is now also available.